BEST SELLER! 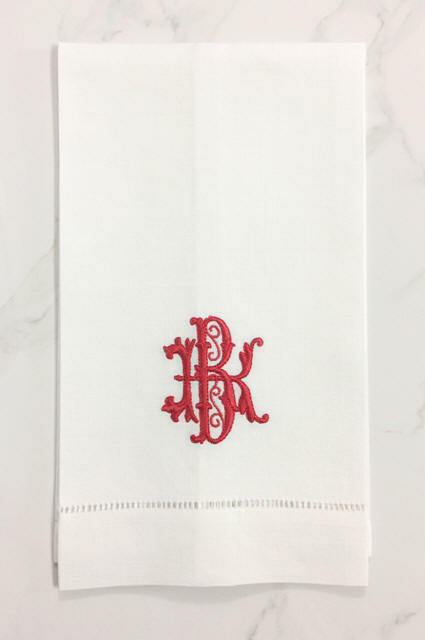 Monogrammed Hemstitch Linen Guest Towel as a two initial monogram. May be embroidered with a contrasting outline color or the same color as shown. Guest towel pairs & sets arrive in our Signature Gift Box with ribbon. This is a great gift for all occasions! The letters I, L, N, T, V, W are not suited for the larger back letter when sewn. We will arrange the letters for the best positioning.